Encountering Al Roth’s ideas has always been a “squaring the circle” experience to me. The man is the epitome of swag (as my students would say), his ideas the hype, and his past achievements ubiquitous in the media. He has become the antidote for post-2008 econ criticisms, the poster child for a science that is socially useful, that saves lives. And yet, as he proceeds to explain the major tenets of market design, I’m usually left puzzled. Yesterday’s presidential address was no exception (edit: here’s the webcast of his talk). 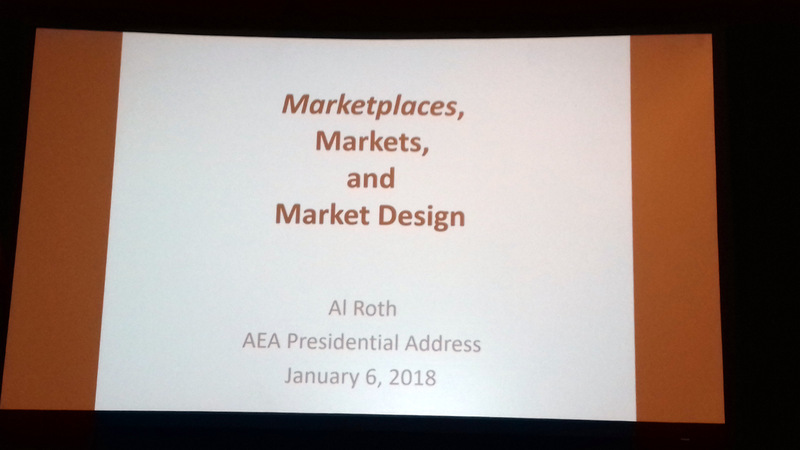 Roth outlined many examples of how matching market design can improve citizens’ life, from making the economics job market thicker to avoiding domestic fights in pediatric surgeons’ households, to substantially raising the number of kidney transplants in the US, thereby effectively saving lives. Though the rules of each market differs, design principles are often identical. Repugnance, congestion or unraveling (people leaving the market because they have to accept job offers early or because they are put off by the matches proposed) threaten exchange, and market thickness is restored through implementing matching algorithms or signaling schemes (like expressing interest for a limited number of job openings). By the end of his talk, Roth nevertheless expressed some frustration. He wishes to do much more: raise kidney matching market thickness through allowing foreigners to participate into US kidney chains of exchange or organize large-scale refuge resettlement. Yet these more ambitious projects are however faced with greater legal challenges, opposition and ultimately repugnance, he lamented. As Roth’s presentation moved from mundane to life-saving achievements, his slides became loaded with ethical statements. Moneyless kidney exchange is “fair,” he argued. Global kidney markets shouldn’t be considered “exploitative.” Yet he never saw fit to discuss the ethical underpinnings of the designs he advances. Is it because, as explained in his introduction, his address focuses on “practical” marketplace design rather than on the identification of the theoretical properties of mechanisms? Or because the underlying ethics is obvious – isn’t raising the number of kidney transplants a universally accepted policy end? Or because he believes that the opposition to his international kidney market scheme betrays an unwarranted sensitivity on repugnance? Elsewhere, he has argued that economists should not take for granted citizens’ repugnance to engage in some kind of transactions (money landing or prostitution are other historical examples). That society has banned markets for such transactions has sometimes harmed their welfare, and Roth believes it is possible to carefully design such markets in a way that commodification and coercion won’t happen. My puzzlement is twofold. As a historian, I find economists’ contemporary reluctance to get their hands dirty with ethics (Roth is not alone is this) highly unusual. For, contra the popular received view, those economists usually considered the founders of contemporary economics like Paul Samuelson or Kenneth Arrow were constantly arguing about the ethical foundations of their discipline, in particular welfarism. And as an observer of a changing discipline, I fear that this ethical shyness may at best prevent them from communicating with their public, at worst backfire. Let me elaborate. Once upon a time, economists were not shy of handling normative issues. Though the XVIIIth and XIXth centuries were largely about separating out positive from normative analysis (and preserving a space for the “art of economics”), both were considered equally important parts of “political economy.” Reflections on neutrality, objectivity and impartiality, dating back to Adam Smith, were carried out separately. Max Weber was, at the turn of the XXth century, one of the first to relate ethics to subjectivity, through his quest for a reconciliation between an ideal Wertfreiheit (value-freedom) and an inescapable Wertbeziehung (relation to values through relation to the world, aka human condition). In the next decades, as the Popperian positivist mindset gradually replaced the aristotelician hierarchy between ethics and science, economists began hunting for subjectivity, and in the process ended up pushing normative thinking outside the boundaries of their science. In his famous Essay on the Nature and Significance of Economic Science (1932), Lionel Robbins outlined a clear separation between ends and means, is and ought, ethics and economics and normative and positive analysis. He did so by combining these with the fact/value distinction. Science was concerned with the confrontation with facts, he hammered. Interpersonal utility comparisons, which required “elements of conventional evaluation,” therefore fell outside the realm of economics. Robbins’s British colleagues attempted to construct a value-free welfare economics. One exemple is Nicholas Kaldor and John Hicks’s Paretian compensation criterion. These endeavors were met with considerable skepticism in America. US economists strived to make their discipline more scientific and objective through an endorsement of Popperian falsifiability (apparent in Friedman’s famous 1957’s methodological essay), mathematization, data collection and the refinement of empirical techniques aimed at purging economic theories and models from subjectivity, rather than by trying to avoid normative statements. Those were inescapable if the economist was to be of any help to policy makers, researchers concurred. New Welfare “cannot be used as a guide to social policy,” Arrow complained in his 1951 Social Choice and Individual Values PhD. “Concretely, the new welfare economics economics is supposed to be able to throw light on such questions as to whether the Corn Laws should have been repealed,” yet it “gives no real hue to action,” Samuelson likewise remarked in his 1947 Foundation of Economics Analysis. Samuelson and Arrow are usually credited with laying out the theoretical and epistemological foundations for contemporary “mainstream” economics, yet each spent an inordinate amount of time crafting out a space for normative analysis rather than getting rid of it. “Ethical conclusions cannot be derived in the same way that scientific hypotheses are inferred/verified… but it is not valid to conclude from this that there is no room in economics for what goes under the name of ‘welfare economics.’ It is a legitimate exercice of economic analysis to examine the consequences of various value judgments, whether or not they are shared by the theorist, just as the study of comparative ethics is itself a science like any other branch of sociology,” Samuelson warned in Foundations. In those years, Gunnar Myrdal was crafting a new epistemology whereby the economist was to identify societies’ value judgment, make his choice of a value set explicit, and import it into economic analysis. Georges Stigler likewise claimed that “the economist may … cultivate a second discipline, the determination of the ends of his society particularly relevant to economic policy.” Abram Bergson concurred that “the determination of prevailing values for a given community is… a proper and necessary task for the economist.” Richard Musgrave would, in his landmark 1959 Theory of Finance, later join the chorus: “I have reversed my original view … the theory of the revenue-expenditure process remains trivial unless [the social preferences] scales are determined,” he explained. The postwar was thus characterized by a large consensus that the economist should discuss the ethical underpinning of his models. Objectivity was ensured, not by the lack of normative analysis, but by the lack of subjective bias. The values were not the economist’s ones, but some he chose within society, usually resulting from a collective decision or a consensus. In any case, economists were tasked with making choices. Throughout the Cold War, economists did not shy away from arguing over the weights they chose for their cost-benefit analysis, for instance, or about how to define “social welfare” and embed it into one of economists’ favorite tools, the social welfare function. Though it was ordinal, it allowed interpersonal comparisons of “irrelevant alternatives” and was meant to allow any policy maker (or dictator) to aggregate the values of the citizens and use it to make policy decisions. “You seriously misunderstand me if you think I have ever believed that only Pareto-optimality is meaningful […] Vulgar Chicagoans sometimes do but their vulgarities are not mine,” Samuelson later wrote to Suzumura. It was, Herrade Igersheim documents in a superb paper his main bone of contention with Arrow. For 50 years, Arrow claimed that his impossibility theorem was a serious blow to Samuelson’s tireless promotion of the Bergson-Samuelson social welfare function. And for 50 years, Samuelson argued his construct was essentially different from Arrow’s one: “Arrow has said more than once that any theory of ethics boils down to how the individuals involved feel about ethics. I strongly disagree. I think every one of us as individuals knows that our orderings are imperfect. They are inconsistent; they are changeable; they come back […] People talk about paternalism as if we were bowing down to a dictator, but it is wrong in ethics to rule out imposition, and even dictatorship, because that is the essence of ethics,” he continued in his aforementioned letter to Suzumura (excerpted from Igersheim’s paper). Samuelson and Arrow both endorsed a welfarist and utilitarian ethics (policy outcomes should be judged according to their impact on economic agents’ welfare). Beginning in the early 1970s, a host of alternative approaches flourished. Arrow himself moved to Harvard with the explicit purpose of delving deeper into ethical and philosophical topics. He founded a joint workshop with Amartya Sen and John Rawls that explored the latter’s notions of fairness and justice. Alternative theories and measures of well-being and of inequality were developed. Joy, capabilities and envy were brought into the picture. And yet, it was in that period that, through benign neglect, ethical concerns were finally pushed to the side of the discipline. Economics remained untouched by the Kuhnian revolution, by ideas that scientists cannot abstract from metaphysics and that “pure facts” simply doesn’t exist (see Putnam’s work). Just the contrary. Though heterodoxies have constantly pointed to the ideological characters of some fundamental assumptions in macro and micro alike, economists now routinely considered their work has having no ethical underpinning worth their attention. The ‘empirical revolution’ – better and more data, more efficient computational devices, thus an improved ability to confront hypotheses with facts – is considered as a gatekeper. And economists have become increasingly shy to engage in ethical reflection. Nowhere is this state of mind more obvious than in theoretical mechanism and applied market design, a field that, as AEA president-elect Olivier Blanchard pointed out, is not merely concerned with analyzing markets but with actively shaping them. It is possible, however, to eliminate some of the arbitrariness inherent in defining the common good… to abstract ourselves from our attributes and our position is society, to place ourselves « behind the veil of ignorance »… The individual interest and the common good interest diverge as soon as my free will clashes with your interests, but they converge in part behind the veil of ignorance. The quest for the common good takes as its starting point our well-being behind the veil of ignorance …. Economics, like other human and social sciences, does not seek to usurp society’s role in defining the common good. But it can contribute in two ways. First, it can focus discussion of the ojectives embodied in the concept of the common good by distinguishing ends from means…. Second, and more important, once a definition of the common good has been agreed upon, economics can help develop tools that contribute to achieving it … In each [chapter], I analyze the role of public and private actors, and reflect on the institutions that might contribute to the convergence of individual and general interest – in short, to the common good. What Tirole does here is reprising a theme Cold war economists faced with the difficulty of choosing ethical foundations for their work often relied on: the notion of a underlying social consensus. Needless to say, this is not enough to silence the reader’s ethical questions when walked through Tirole’s proposed policy to fix climate change, Europe’s failing labor markets or financial regulation, or to harness digital markets. As expected, philosophers, historians and sociologist of mechanism and market design have been much less shy in commenting on the ethical foundations of the field. In the interest of keeping this already too long piece in acceptable boundaries (and attending a few ASSA sessions today), I’m merely providing an non-exhaustive list of suggested readings here. Philosopher Michael Sandel has confronted market designers’ constructs in his book on What Money Can’t Buy, economic philosophers Marc Fleurbaey and Emmanuel Picavet has provided extensive reflections on the moral foundations of the discipline, and Francesco Guala has masterfully excavated the epistemological underpinnings of the FCC auctions. Sociologists Kieran Healy, Dan Breslau and Juan Pardo-Guerra have investigated the ethics and politics of, respectively, organ transplants, electricity market design, and financial markets. There’s also the wealth of literature on performativity (by Donald Mckenzie, Fabian Muniesa, or Nicolas Brisset among many others). Munesia, for instance, disagrees with my shyness diagnostic. He rather see market designers as ethically disinhibited. Neither is shyness to be found in the history of mechanism design published this Fall by Phil Mirowksi (who has extensively written on the history of information economics) and Eddie Nik-Kah (whose PhD was an archive-based investigation of the FCC auctions). The core of their book is a classification of the mechanism and market design literature in three trends, each reflecting a distinct approach to information. How economists view and design market is closely tied to their understanding of the role of agents’ knowledge, they explain. The first trend was the Walrasian school, architected at Cowles under the leadership of Arrow, Hurwicz, Reiter and the Marschaks (even Stiglitz and Akerlof to some extent). They considered information as a commodity to be priced and mechanism as a preferably decentralized information gathering process of the Walrasian tâtonnement kind. The Bayes-Nash school of mechanism design originates in Vickrey and Raiffa, and was spread by Bob Wilson who taught the Milgrom generation at Stanford. Information is distributed and manipulated, concealed and revealed. Designing mechanism is thus meant to help them make “no regret” decisions under asymmetric and imperfect information, and this can be achieved through auctions. The experimentalist school of design, including Smith, Plott, Rassenti and Roth is more focused on the algorithmic properties of the market. Information is not located within economic agents, but within the market. This view is a bit light, and it might even backfire. First, because as pointed out by Sandel to Roth here, agnosticism is itself a moral posture. Refusing to consider repugnance as a moral objection rather than a prejudice itself shows economists’ repugnance (my term) to engage with moral philosophy, Sandel argues. Second, because the question of whose values drive the practices of market designers and economists more largely cannot be easily settled with an appeal to consensus and to “obvious ends.” That more lives should obviously be saved, that more citizens should obviously should be fed, that inequalities should obviously be fought (which wasn’t that obvious 20 years ago), that well-being should obviously be improved seems to dispense economists with further inquiry. Doesn’t everyone agree on that? Marc Fleurbay has encouraged economists to think more explicitly about the concrete measures of wellbeing embodied in economic models and with question of envy and independent preferences. The utilitarianism that has shaped economic tools in the past century has been challenged in the past decade (see Mankiw’s comments here or Li’s paper), and that economists’ focus is currently shifting to re-emphasize wealth and income inequality as well as the role of race and gender in shaping economic outcomes in fact carries a set of collective moral judgments. Third, because market designers’ tools have grown so powerful, there should be a reflection on what their aggregate effects on distribution, fairness and various conceptions of justice and well-being is/should be, and on who should be accountable for these effects. Economists have been held accountable for the 2008 financial collapse. What if a market they had contributed to design badly screw up? What if their powerful algorithms are used for bad purpose? When physicists, psychologists and engineers have sensed that their tools were powerful enough to manipulate people or launch nuclear wars, they have set up disciplinary ethics committees, gone into social activism and tried to educate decision makers and the public. How about economists? Finally, the market designers’ rationale outlined above crucially depends on one key assumption: that the ends those designs are meant to fulfill reflect the common good, or a democratic consensus or at least a collective decision carried by a benevolent policy-maker. In Tirole’s book, the economist’s client is society. In Li’s paper, the market designer’s client always and only is “the policy-maker.” But there’s tons of research challenging the benevolence of policy-makers. And more fundamentally, what if the funding, institutional and incentive structure of the discipline, and of market design in particular, is shifting toward corporate interests? Historians have shown how Cold War economics has been shaped by the interests of the military, then the dominant patron. How acceptable is shaping markets on behalf of private clients such as IT firms? If these questions are not going away, it because they are not deficiencies to be fixed through scientific progress, but choices to be made by economists, no matter how big their data and powerful their modeling tools. Unpacking the epistemological and ethical choice mechanism design make, the benefits they expect, but also the paths foregone is important. Great post. My field is law, and I would agree that my colleagues and I should likewise be asking what the ethical foundations of the various branches of law are, especially since markets require a legal and moral framework for markets to work.